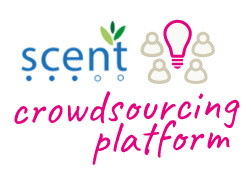 The crowdsourcing platform is a key digital infrastructure of the Scent Toolbox, connecting all applications and services and orchestrating their functionality in a purposeful manner. It acts as a central data broker that links the Scent frontend applications used by citizens to provide images, annotations, sensory data, event reports and videos, to all the other toolbox components. The crowdsourcing platform allows local authorities to configure and manage crowdsourcing campaigns, define points of interest where pictures and measurements are needed, and monitor in real-time the pictures collected by citizens and the issues reported. It also manages the complete lifecycle of citizen-generated images. Once a citizen takes a relevant picture using the Scent Explore app, the picture is sent to the crowdsourcing platform. It stores a copy of the image on the cloud and makes it available to the Scent artificial intelligence ‘heart’, also known as the Scent Intelligence Engine (SIE), which uses advanced machine learning techniques to automatically understand what is in the image. The annotations are fed back to the crowdsourcing platform, which is in charge of deciding whether the quality of the annotations is sufficient. If not, the image is made available for being further annotated, this time by people, through the CAPTCHA plugin or the Scent Collaborate app. Considering the constantly increasing volume of citizen-generated data, it is of high importance to ensure that data of different origin are comparable and compatible, whilst facilitating their integration into models and the development of new applications. To this end, data collected from citizens should be easily discoverable, accessible, re-usable and available for future use. Scent meets these aspects of data interoperability through the development of a Harmonisation platform that enables the management, storage and provision of all citizen-generated data and added-value information produced by the various Scent tools (i.e. improved Land Cover / Land Use maps, flood risk maps) and translates them to standardised resources following the Open Geospatial Consortium (OGC) standards. The Harmonisation platform implements also a Data Quality Control system aiming to cope with the following main challenges: correctness/accuracy of the user measurements, user reliability and protection of the system from malicious contributions. Finally, to achieve a maximum impact on scientific research and public policy, these resources will be also offered to the GEOSS portal and other relevant national repositories through a standardized way. The Scent Toolbox includes hydrodynamic and hydrological models that have been set up for the two pilot areas of Scent; the Danube Delta and the Kifisos catchment. The models are computational representations of water dynamics in the pilot areas, and they are initially built using existing ground observations and remote sensing data. After the Scent field campaigns, the models will be enhanced with crowdsourced data. The value of citizens’ contributions and their role in generating improved flood risk maps and spatiotemporal flooding patterns will be assessed. The different characteristics of the two areas require different modelling approaches. In the Danube Delta, specifically in the Sontea-Fortuna pilot area, two hydrodynamic models were set up in order to simulate the complex network of channels and lakes in the area: one 1D model and one 1D/2D model. In the Kifisos catchment, the pilot area is the upstream region of Athens city, where many hydrological components of the water cycle are more influent. A combination of models was therefore set up: a hydrological model connected to a hydrodynamic model at the end of the basin. These models form a key component of the Toolbox as they serve as a basis for determining how they can be enriched through crowd-sourced data. Scent enables the collection of river measurements in a uniform way, which is useful to the development of flood models and invariant of the experience of the volunteers to collect the scientific data. In order to properly collect river measurements, scientists use a variety of methods that require extended training and can be very time-consuming. To avoid that, the Scent volunteers are simply asked to take a picture of a water level indicator or a video of the predefined floating object and upload it through the gaming applications. The crowdsourced data is then forwarded to two tools that have been specifically designed to automatically extract the water level and the water velocity in a consistent and accurate way. The water measurement tool uses state of the art image recognition techniques in order to extract the water level from images containing a water level indicator that is half-submerged into water. The goal of the tools is to ‘read’ the indicator and extract the number that is closer to the water level. The water velocity calculation tool uses innovative video processing algorithms in order to extract the water surface velocity from a video containing a pre-defined floating object moving on the surface of a water body. 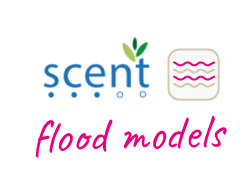 Scent introduces novel machine learning approaches that automatically detect and annotate segments on satellite and aerial imagery, with land cover / land use (LC/LU) elements that affect flood risk and flood pattern determination (i.e. river banks, forests, buildings, etc). Citizen-generated data are utilized for the training of the map segmentation tool, that aims to produce LC/LU maps of improved accuracy which are essential for the construction of hydrodynamic and hydrological models. These models are used to produce flood risk and pattern maps for urban and rural flood cases. Last but not least, there is a prominent need to include automatic assessment and monitoring of land cover and state of soil in rural and urban areas as well as to detect seasonal changes, natural disasters, and human-related area development. Thus, the map segmentation tool aims to extend current repositories (i.e. GEOSS) by allowing for more frequent updates of local monitoring of land cover/use changes and with higher spatial resolution, using inexpensive crowd-sourcing tools. Explore your surroundings with Scent Explore! Scent Explore is an augmented reality game developed for the Scent project by XTeam Software Solutions. Scent Explore invites you to discover your environment in an exciting way. Little Scent Explore characters are hiding in interesting places around you, and you collect points when you find them! Your smartphone or tablet will give an audio alert when you are approaching a character. To earn points, just tap on the screen to capture a character when you see it. Your camera will take a photo of the location and upload it to Scent. Compete with your friends and family and see who wins! By playing Scent Explore, you make a valuable contribution to citizen science. You help researchers understand changes in the environment because all the locations in which you catch Scent characters contain interesting information that researchers will use to analyse and map the environment. Join the Scent movement and become a citizen scientist today! Scent Collaborate is a browsing-based crowdsourcing platform developed by XTeam for the Scent project. Scent Collaborate allows users to train and improve the Scent automated tools simply by browsing existing images and labelling them. Teaching the tools to identify pastures, forests, river banks, buildings, paved areas etc. will allow for more accurate mapping of the environment, which in turn will help predict and prevent flooding and other natural disasters. Scent Measure is an innovative application developed by ICCS for the Scent project to measure changes in soil conditions. The app uses portable sensors to measure and report the soil moisture and air temperature to your smartphone or tablet. Scent Measure is easy to use – simply insert the portable sensor into the soil, select whether to measure temperature or moisture, and receive the measures directly to your screen. Scent Measure is triggered from Scent Explore app. When playing Scent Explore, you will be prompted to take a measurement at an important point of interest for scientists and researchers, and thereby contribute to monitoring and analysing your environment. The Scent Campaign Manager is a web-based application developed by ICCS for the Scent project, which allows public administrators, policy makers and other interested users to create and manage citizen science campaigns for monitoring and streamlining the collection of environmental information. The Scent Campaign Manager allows users to select a specific area of interest to set up a Scent campaign. Citizens can then join the campaign by using the ‘Scent Explore’ and ‘Scent Measure’ apps to take photos of Land-Cover and Land-Use and gather important environmental information about the campaign area. If you are interested in registering as a user and set up a Scent campaign in your city, town or urban area, please contact ICCS via email at: ScentCampaignManager@lists.scent-project.eu.